258 Saturday February 9th 1889 Will took me over to Hattie's in the forenoon and took dinner there. Mollie Stevens was spending the day there I had a pleasant visit and came home about four oclock Mother came over in the afternoon to bring Edith home. Sunday February 10th 1889 It was an unpleasant day. I helped a little with the work and read and wrote some besides playing on the piano a little. There were none of the folks over from town. 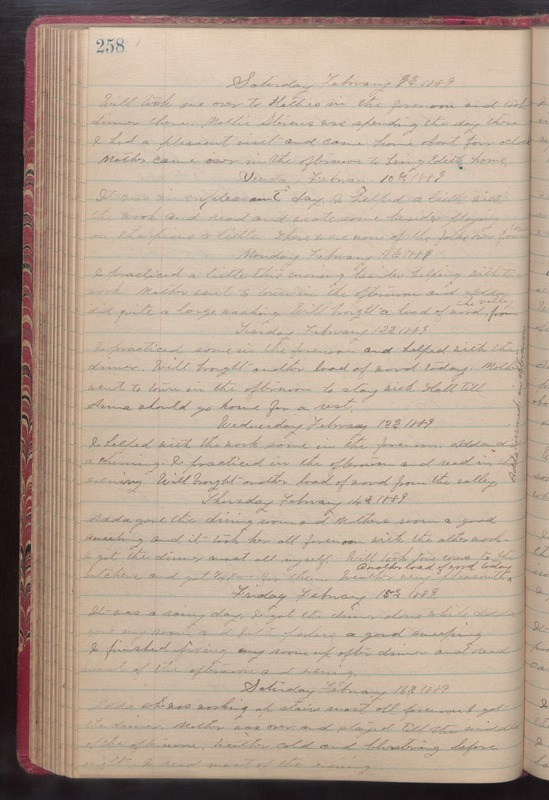 Monday February 11th 1889 I practiced a little this morning besides helping with the work. Mother went to town in the afternoon and Adda did quite a large washing. Will brought a load of wood from the valley. Tuesday February 12th 1889 I practiced some in the forenoon and helped with the dinner. Will brought another load of wood today. Mother went to town in the afternoon to stay with Hatt till Anna should go home for a rest. Wednesday February 13th 1889 I helped with the work in the forenoon. Adda did a churning. I practiced in the afternoon and read in the evening. Will brought another load of wood from the valley. Adda ironed in afternoon. Thursday February 14th 1889 Adda gave the dining room and Mothers room a good sweeping and it took her all forenoon with the other work. I got the dinner most all myself. Will took five cows to the butcher and got $47-- for them. Weather very pleasant. Another load of wood today Friday February 15th 1889. It was a rainy day. I got the dinner done while Adda gave my room and both parlors a good sweeping I finished fixing my room up after dinner and read most of the afternoon and evening. Saturday February 16th 1889 Adda who was working up stairs most all forenoon got the dinner. Mother was over and stayed till the middle of the afternoon. Weather cold and blustering before night. I read most of the evening.